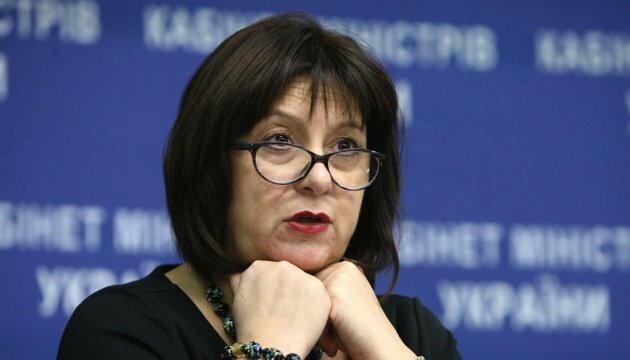 Ukrainian Finance Minister Natalie Jaresko in 2015 declared UAH 121.700 of income, of which UAH 72.965 - the salary over the year. The income statement of Minister Jaresko was posted on the official finance ministry’s website. Minister Jaresko earned another UAH 407,000 outside Ukraine, and her family members earned UAH 894.700. According to the declaration, the minister holds UAH 56.798 million on bank accounts, of which UAH 55.224 million – in foreign banks, and UAH 1 million in Ukraine. Her family members have UAH 2.3 million on bank accounts. Jaresko owns two land plots of 0.3 and 0.699 hectares, and she jointly owns a house with an area of 1287.5 square meters. According to the declaration, the finance minister and her family members own no car. Also, Jaresko in 2015 paid UAH 4.46 million on credit obligations, and almost UAH 14 million was spent on “other expanses”.